Nice, large and well-equipped apartment in which can be accommodated up to 6 people, second floor, category ***, air conditioning, three bedrooms (each with exit to the balcony) , kitchen with dining room, two bathrooms, large balcony with beautiful view of the sea, small balcony with view of the sea, grill, large private car park, smoking in the apartment is not allowed (is allowed on the terrace). Kitchen equipment: kitchen utensils and tableware according to the number of persons, gas-electic kitchen, electric kettle, fridge, deep freeze, microwave. Large bathroom equipment: complete, bath with shower. Number of rooms: 2, the total number of beds in rooms: 4, number of double beds: 2, number of single beds: 2. 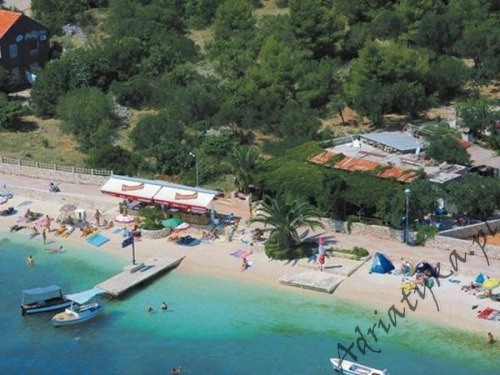 Distance to the bus stop is 15 m, distance to the train station is 10 km (Kastela), distance to the nearest airport is 6 km Split (Trogir), distance to the nearest ferry port is 30 km (Split), distance to the main road is 20 m, distance to the nearest exchange bureau is 3 km, distance to the cash point is 3 km, distance to the restaurant is 50 m, distance to the grocery store is 50 m, distance to the petrol station is 4 km. Very nice pebble and stony beach, distance to the beach is 200 m, distance to the sea is 210 m.
The apartment is located on the second floor of nice, very large building. Guests have at their disposal two balconies with beautiful view of the sea, very nice living room (open to public) with TV-SAT, large private parking and grill. Changing of bed linen and towels every 7 days. Air conditioning: service included in the rental price. Check-in after after 14:00 h., Check-out till 10:00 h.
The owner speaks Croatian, English, German, French and Italian. Attention!! Owner accepts reservations for minimum 10 days.